According to industry analysts, email volume in organizations is growing by more than 30% annually, and the average user receives 7MB of data per day via email. if not more. As a result of this growth, the handling of email has become a critical business, IT and regulatory issue - driving the need for email archiving solutions. 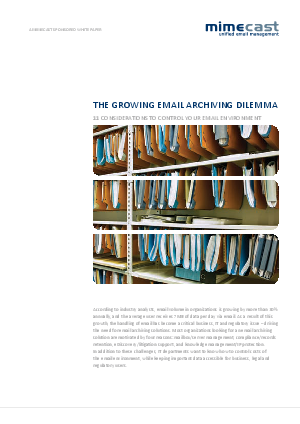 Most organizations looking for an email archiving solution are motivated by four reasons: mailbox/server management, compliance/records retention, eDiscovery/litigation support, and knowledge management/IP protection. In addition to these challenges, IT departments want to know how to control costs of the email environment, while keeping important data accessible for business, legal and regulatory users. This whitepaper will cover archiving and email management, eDiscovery and knowledge management, as well as list and discuss 11 considerations to control your email environment.